For exercise bikes and adult tricycles. The softest and most luxurious bike and exercise bike seat cover anywhere! This is our best seat. Measures a full 16” wide and 12” long! Extra thick genuine sheepskin covering, much thicker and more durable compared to the competition! Because of Sheepskin’s ability to act as a natural thermostat. From arctic cold to tropic heat; sheepskin will keep you warm when its cold and keeps you cool in the heat. In summer you stay cool because of the Sheepskin's ability to wick moisture away from you. A single fiber can absorb 30% of its weight in body vapor thus cooling you down. In winter you stay cozy because Sheepskin is a natural insulator. Air spaces between the fibers trap body heat and circulate warm air next to your body. You stay warm even on the coldest nights. Sheepskin will not only keep you cool in the summer and warm in the winter, it will protect your investment. With what American’s have to spend to buy exercise equipment these days, it makes sense to protect that investment. Sheepskin keeps your bike looking like new. I love this seat cover! It makes all the difference. It is thick and plush and fits the seat extremely well. I have a bad back and never thought I would ride a bike again. However, because of this seat seat cover, I am not only riding but very comfortable. I bought this sheepskin cover specifically to keep from sliding on the seat as I was doing. Though having my seat adjusted did help as well. 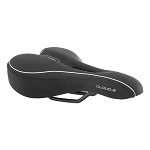 The cover is very soft and I did have to stretch it quite a bit, my Day6 bicycle seat being very large. However,it did go on and helps me to sit taller and not slide. I am very happy with it. 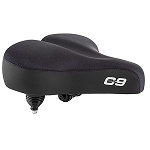 Very difficult to slip onto the 16" contour seat. Once that was done it seems very comfortable, worked well on a recent hot day. Looking forward (not to forward) to the cooler weather benefits of this set up. The seat is mounted on a Baja Cruz fat tire cruiser, really makes the bike, says cruiser all the way. I have been riding on it for two weeks and am pleased. However, I have ordered a two inch piece of foam rubber to put under it to help improve the comfort of long rides. Thie a VERY NICE, WELL MADE SEAT COVER. IT FITS WELL. VERY FAST SHIPPING. I ORDERED IT ON SUNDAY, APRIL 22 AND RECEIVED IT ON APRIL 25.